Somebody once said, “What a damn fool can do for a dollar, an engineer can do for a nickel”. Thinking about cost as an engineering constraint brings new life to old ideas (physics). This is what makes the difference between an idea influencing a hundred people or a billion! With our planet literally teeming with problems, it’s time to take cost constraints into serious consideration. As physicists and engineers, we know how to make stuff. We use these skills (and field work) to design solutions for extremely resource constrained settings, especially in the field of global health. Our work in this area extends from field diagnostics to hands-on science education. Dr. Prakash leads a curiosity driven research group working in the field of physical biology. Their approach brings together experimental and theoretical techniques from soft-condensed matter physics, fluid dynamics, theory of computation and unconventional micro and nano-fabrication to open problems in biology: from organismal to cellular and molecular scale. They design and build precision instrumentation including droplet microfluidic tools to probe and perturb biological machines and their synthetic analogues. Along the way, they invent novel technologies in global health context with clinical applications in extreme resource-poor settings. 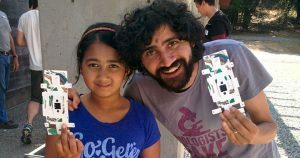 Best known for the “foldscope,” or low-cost microscope, Dr. Prakash is an Assistant Professor of Bioengineering at Stanford University. He has been hailed as an HHMI-Gates Faculty Scholar, a MacArthur Fellow (2016), an Emerging Explorer by National Geographic (2015), and one of Popular Science Magazine’s “Brilliant 10” (2014).